Poori is a Popular Breakfast Recipe in India loved by all Ages. 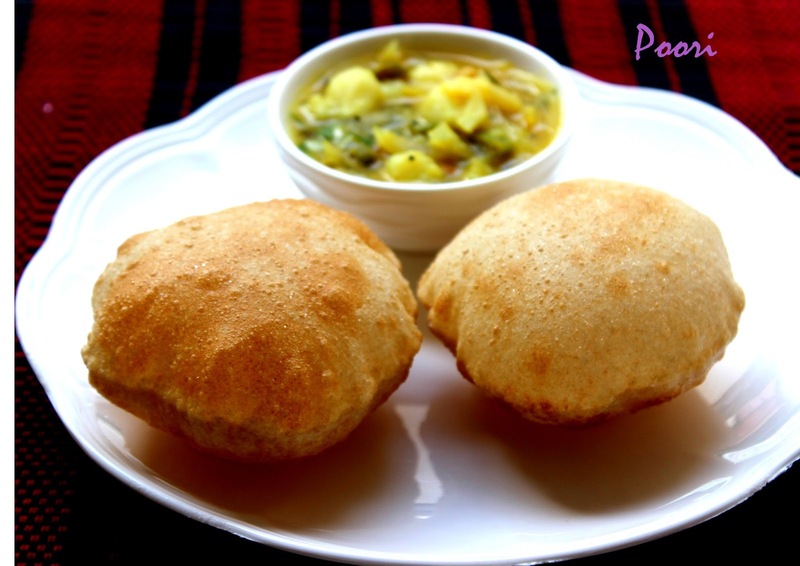 Poori is an kids friendly Recipe. It is made with whole wheat flour. I have shared some tips & tricks in making Puffy Poori's.My MIL always makes Puffy Poori's. she has given some tips & tricks in making the Poori. So I am sharing with you all. My daughter is a big fan of this Poori. During her weekly holidays either on saturday or sunday, weekly once we make this Poori. Prep Time : 10 min. yield : 9 - 10 poori's. Wheat flour - 1 cup. Melted Ghee - 1/2 tsp. Sooji Rava - 1/2 tsp. Take a Mixing bowl, Combine Wheat flour, Melted Ghee,Sooji,Salt & mix well. Add water little by little to make a soft smooth & stiff dough. Make sure dough should not be sticky. After making the dough,immediately you should start preparing the poori's. Take small lemon sized dough & flatten it lightly as shown in the picture. Dust it in flour and roll into small poori's with a help of rolling pin, not too thin or too thick. Arrange the rolled poori's in plate or Paper. Heat the oil, to check oil is hot.Oil should be hot, but not smoky. Now drop a pinch of dough into hot oil, it should pop up immediately & also it should not be browned. This is the Right Temperature of oil. Now, slide a rolled circular disc into oil,after a second press the poori with a slotted ladle, immediately Poori's Puff up.Now carefully flip the Poori's & fry till Golden.Remove carefully using a slotted ladle & drain it in a tissue Paper. Repeat the same procedure for rest of the dough. Adding Ghee gives nice flavour to Poori. Adding Rava is used to maintain the crispiness. Add water little by little to make a Soft & stiff dough.Dough should not be sticky. Make the poori's immediately as soon as you make the dough. Roll the dough into medium sized circular disc not too thick or thin. if you are making in large quantity roll the dough in batches. Dust the dough with little flour, with more dusting leaves the residue while frying the Poori's. The temperature of the oil should be hot, but not smoky. if the temperature is low, Poori won't raises up & drinks more oil. Wow, This looks fantastic and perfectly made, addition of sooji is new but sounds great. Thank you so much for this great share..
Wow! Your puris indeed look fluffy, I also add suji for that crispy texture! Perfectly puffed up pooris!! Very good post for beginners! !